Would you blindly schedule manufacturing work orders with a best guess method? You could, but with that method your profit margins may have shrunk or you may have double booked an essential production machine. We understand that efficient manufacturing operations is essential for profitability and company growth. Unfortunately, many manufacturers are tied down by manual operational management inefficiencies. Manufacturers are ignoring the best practice suggestions for the industry by simply “doing things the way they’ve always done things.” But what if there was a solution out there that could combine your current processes and streamline them using the latest manufacturing technology? That’s where manufacturing ERP comes in. Manufacturing ERP simply integrates all functions of a manufacturing company into a single solution that provides real-time information from the shop floor to the top floor. Done right, manufacturing ERP allows manufacturers to understand and adjust to changing manufacturing operational activities in real-time – decreasing production downtime and increasing overall efficiency. Today, the ability to be agile with manufacturing operations is a critical capability in such a fast paced, “need it now” environment. For modern manufacturers, manufacturing ERP is not just a ‘nice-to-have’; it’s a necessity in today’s market where the ability to remain competitive relies on efficient, quality and customer focused manufacturing operations. With manufacturing ERP, you always have up-to-date schedules, job statuses and lead times. Without real-time manufacturing operations resources, that “best guess” mentality takes over – limiting reliability and execution capability. Learn more manufacturing ERP and how to select manufacturing ERP for your manufacturing team by paging through The Definitive Guide to Manufacturing ERP. 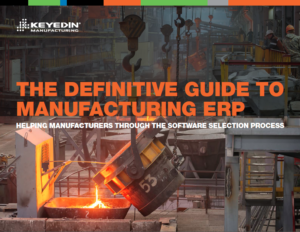 This comprehensive guide covers everything from what manufacturing ERP is, how Cloud ERP differs from On-Premises, what the manufacturing ERP purchase process should look like and how to be successful with manufacturing ERP! The Definitive Guide to Manufacturing ERP is your guide to improving operational efficiency and increasing company growth. Download it today!